Someday I fancy myself as the “Tagine Queen” making marvelous succulent, spicy meals in one of oldest cooking vessels known to man, the Tagine cooking pot . Ok, that’s a bit of a stretch, but I will tell you that I’m loving the journey of discovering this earthenware pot that makes the most flavorful meals. I have to thank Jeff Morgan at Cost Plus World Market in Scottsdale. I was looking for some new ideas, simple cooking methods, fresh approaches to kitchen techniques and Jeff guided me over to the Tagine. It looked intimidating. The learning curve would be too steep. Middle Eastern cooking was not in my wheelhouse. I was so wrong on all fronts! 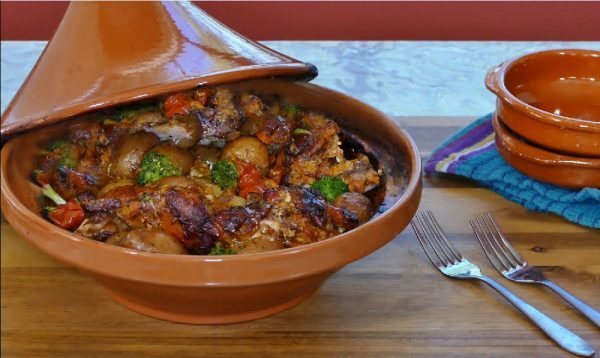 In fact, it’s about as much fun as you can have cooking for under twenty dollars, which is the cost of the glazed Tagine cooker that I settled on. You choose your ingredients and then lay them on the circular flat low base. Then add your spices, place the lid on and into the oven it goes! What happens there is incredible. The steam rises up the domed top of the Tagine, which is designed to return all of the condensation to the bottom pot. So that steam falls back down into the food to create moist and succulent veggies, chicken, fish, lamb, or whatever ingredients you decide upon. It’s also the perfect vessel to let the spices marry. Because the heat is distributed so evenly it’s like having a convection oven within your oven! When the food is done, you remove the domed lid and bring the base right to the table and serve from there. It’s fun, it’s easy, it’s communal and the cleanup is ridiculously simple. For me, it’s a new favorite as old as time. If you can't find the spice packet you can make your own!